Christmas trees are coming down, the gifts are being played with, and everyone’s ready to get out of the house and have some holiday fun. The timing’s perfect, because Okinawa, which celebrates both the traditional and Lunar New Year, has oodles and oodles of things happening. New Year’s Eve and New Year’s Day are loaded with events—many of them free—to satisfy every individual and family taste. The Shinshun Kahu Debiru at Okinawa’s Churaumi Aquarium in Motobu is a popular, family-oriented way to spend the New Year holiday weekend. The events are all free. The aquarium, which celebrated its sixth anniversary last month, hosts the three-day festival beginning New Year’s Day. Churaumi Aquarium part of Okinawa Ocean Expo Memorial park, Be sure to take cameras, as there’s plenty of excitement to capture. 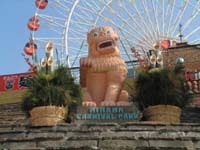 Traditional Ryukyuan dance takes place daily at 9:30 a.m. at the Fountain Plaza, and Shihimai Lion Dance and Eisa Dance will be presented four times daily. The first dance each day is at Uminchu Gate, while the rest are at Fountain Plaza. Ocean Expo Memorial Park has a variety of activities going all three days, including making rice cakes, kite flying, tea ceremonies and Okinawa Donuts giveaways. Other Okinawa products, including lime and aserola juices, and healthy Okinawan soups will also be provided. The park rachets things another notch on Saturday, when Okianwa’s home town village comes alive with traditional kimono wearing, tea ceremonies, lessons in kite making, eisa, drama and samba performances. Ocean Expo Memorial Park in Motobu. Take the Expressway to the northern exit, then highway 58 to Nago City. From there, follow the signs. where the site of the last fighting during the Battle of Okinawa at Mabuni in 1945, forms the backdrop for the illumination, as well as the 31st Mabuni Festival Of Fire And Bell, which has been taking place since 1978. The New Year’s Eve ceremonial highlight is the lighting of the 45-meter high peace monument as the people pray for peace for the coming year. Before the stroke of midnight, the flame of prayer descends from the 45-meter high tower and lights the torches of participants as they welcome the new year, the choir singing in harmony. The Bell of Peace is rung as participants light the large flame holder with their torches, and the jovial fanfare resonates to greet the new year. It is an unforgettable, solemn, emotional festival. Entry fee for the illumination is ¥200 for adults and youth 15 and older. An estimated 120,000 will make the trek south to take in the splendor of more than 1.3 million light bulbs in the display. There will also be fireworks New Year’s Eve, and a countdown heralds in the new year. Lunar New Year, which this year is January 26th, ushers in the Year of the Ox. The second sign of the Chinese zodiac, the Ox is the sign of prosperity through fortitude and hard work. Those born under the sign of the Ox are said to be born leaders, logical, dependable and possessing an innate ability to achieve great things. The traditional new year celebrations are on us, with customs and traditions from around the world being practiced here in Okinawa. New Year’s is the oldest of all holidays celebrated, first begun about 4,000 years ago in ancient Babylon. Starting about 2,000BC, the Babylonians celebrated their new year on March 23rd, an interesting choice since they had no written calendars. Not content with a single day’s festivities, the Babylonians celebrated for 11 days, each with a specific theme. The Roman Empire kept the March date for centuries, but the emperors’ constant tinkering with the calendar finally led the Roman Senate, in 153BC, to declare January 1 to be the official beginning of each new year. The Germans, who used the image of a baby as the symbol of the new year since the early 14th century, passed the idea on to America, where it has flourished. The tradition of using the baby itself began in Greece about 2,700 years ago as they honored their god of wine, Dionysus, by parading a baby about. The time for noodles is either before, or after participation in any (or many) of the New Year’s events, many of which are free. There are a number of traditional New Year’s Eve countdowns to the new year, some free…some not. Last Day Count Down Live at D-Set Café on Kokusai Street in Naha City begins at 9 p.m., with tickets costing ¥1,500. Countdown Live at Beach Tower Okinawa in Mihama begins at 10 p.m., and admission is free. Also free are the Live House MOD Countdown at Mihama, countdown Street Live at American Village, the Countdown live Party at 9 p.m. at Hotel Mahaina in Motobu, Countdown Bash Live at 7 p.m. at Koza Music Town, the 10 p.m. Countdown Party at JAL Private Resort Okuma in Kunigami Village and the Jim Rock Singers Countdown Party at 11 p.m. at Laguna Garden Hotel in Ginowan City. Rinken Band performs New year’s Eve at Kalahai in Mihama, with tickets ¥4,000 at the door. Kanakanaa performs at 7:30 p.m. at Kanagusuku on Kokusai Street in Naha City, with tickets ¥1,000, and the Countdown Party at 7th Heaven Koza in Okinawa City begins at 9 p.m., with tickets ¥1,000. A complete listing of New Year’s Eve activities is listed in the Events section of Japan Update. Nothing is more traditional here in Okinawa than visits to the temples. 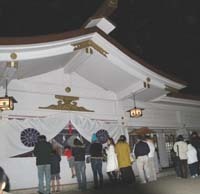 Naminoue Temple will attract tens of thousands beginning New Year’s Eve, as will Futenma and Onoyama shrines. Shortly before midnight, listen for the sounds of bells ringing at temples and shrines. The Japanese tradition, Joya no Kane, the ringing of the bells 108 times, usher in the new year, while warding off evil spirits. A most visible sign of the times, the new year, is the Kadomatsu, the pine decorations. You’ll find the Kadomatsu at entrances to homes, offices and restaurants, welcoming the God and the new year. Look closely at the decorations and note the three bamboo shoots in the center, each with cut tips. Pine trees are a part of the honors, too, because local tradition traces back that pine trees remind everyone to be waiting for God, and that even in the midst of winter all is fresh and bright. Of course, the Japanese’Shogatsu’ New Year Celebration has more traditions, and many are being embraced not only by the younger generation, but by foreigners. ‘Omisoka’ is New Year’s Eve, simply the last day of the month, with the O added as the final element of the year. New Year’s Eve is a time for noodles, too. Toshikoshi Soba noodles are believed to bring long and happy lives, so are extremely popular in restaurants around the island. The festivities continue New Year’s Day, with Ganjitsu, a time for more eating and drinking and sharing with family. Shogatsu is a serious family time, and relatives travel great distances to share even a few hours with each other. Look for O-Zoni, a breakfast fare served New Year’s Day through the 3rd. O-Zoni is a mix of rice cakes in a vegetable soup, with the soup stocks varying from family to family. There’s also the traditional New Year’s dish, O-sechi. It’s hard to describe, as each family modifies the recipe to meet its needs. Suffice it to say, there are sweet boiled black beans somewhere in it. New Year’s Day is a festive day…from dawn to the wee hours. Day breaks at Nakagusuku Mall with a free performance by Ryukyu country taiko drummers Admission is free to a Katsutoshi Matsuda and Mika Uchisato performance at 7 a.m. at the Okinawa Expressway’s Igei Service Area Restaurant. The Okinawa World New Year Water Ceremony starts at 10 a.m. at Okinawa World Theme Park in Gyokusendo, with admission ¥1,600, while the Nanjo City New Year Marathon begins at noon at Chinen City Hall, with admission free. The Nakajin Bullfighting Ring is the setting for the New Year’s Bullfighting Tournament starting at 1 p.m. Tickets are ¥3,000. The Nakijin New Year’s Road Race begins at 10 a.m. Friday, with the start-finish line at Nakijin Sports Park. Bullfighting continues Friday and Saturday at 1 p.m. at Ishikawa Dome with the New Year’s Bull Fighting Tournament. Tickets are ¥3,000. The Ryukyu Golden Kings, Okinawa’s Japan Basketball League team, takes on the Takamatsu Five Arrows Saturday 7 p.m. at Naha Gymnasium. Tickets are ¥3,000, and ¥4,500. Diamantes performs at 8 p.m. January 3rd at JAL Private Resort Okuma in Kunigami Village, with tickets going for ¥3,500. A complete listing of all holiday events, and other activities on Okinawa throughout the month, are at www.japanupdate.com/events.